Michelangelo Antonioni’s first feature film, Cronaca di un Amore (Story of a Love Affair, 1950), was an immediate demonstration of how distinct his style was from that of his Italian contemporaries. Antonioni’s first employment in the movies had been in the area of film criticism, but soon he found his way into the Italian film industry as a documentary filmmaker. This work led him naturally to work with members of the emerging Italian Neorealist cinema movement in the late 1940s, and one might have expected that that experience, along with his progressive political views, might have led him to continue in the Neorealist framework. But after some successful documentary films, his debut feature, Cronaca di un Amore, pointed in a different direction. One difference was the social focus: Antonioni’s Neorealist contemporaries had reacted against the Telefono Bianco (“white telephone”) style of conventional Italian cinema by concentrating on the everyday circumstances of the lower classes. And though Antonioni had worked with those artists with his documentaries, his focus here is on more cultured classes looking for something beyond the humdrum nature of ordinary existence. The film begins as something of a mystery, with detectives hired to look into the past love life of a wealthy industrialist’s wife, and indeed the film retains all the earmarks of a film noir throughout much of the story. And yet Cronaca di un Amore wanders away from the typical film-noir dramatics and really does become the psychological story of a love affair. Along the way it touches on the shifting feelings of desire, guilt, and personal insecurity. What immediately stands out when one watches the film is the moody mise-en-scène that was already well developed in this, Antonioni’s very first feature. 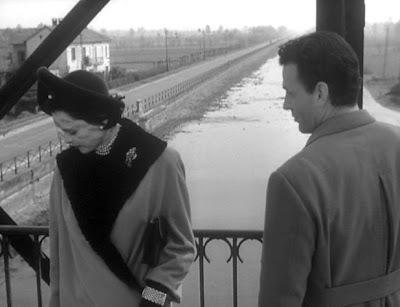 Already Antonioni emphasizes the stylistic feature of incorporating the physical environment and imposing background architectures into the mood of a scene. Notable in this film are scenes in which the encircling camera movements depict the agitated conversations on the circular staircase and on the highway bridge. He would enhance this emphasis in his subsequent films. Antonioni employed long, carefully contrived camera-tracking shots throughout much of the film. By doing this he could steer clear of conventional shot/reverse-shot camera alterations employed to provide points of view, and instead he choreographed the character movements and the prowling camera to achieve the various points of view that he wanted by alternative means. With the constant, restless character movements that take place in extended dialogue scenes, there is a perpetual awareness of the gestures and expressions of the characters, rather than the precise words -- and this facilitates the expression of feelings beyond the specific things that are being said. As a consequence, those scenes have a dynamism that forestalls any feelings of stasis and inertia. The style also occasions frequent situations in which the speakers are in non-face-to-face postures. In fact it will become a characteristic feature an Antonioni film to have characters talking to each other while facing away from their conversational partners. One should not go so far as to say, as some critics do, that this dialogue techni que invariably connotes alienation. But it does suggest that the characters are at least pondering what they are about to say and are absorbed with issues that may go beyond what is immediately being discussed. Character backgrounds. A detective, Carloni, is hired by extremely wealthy and jealous industrialist Enrico Fontana to investigate the past love life of his beautiful 27-year-old wife, Paola. Carloni goes snooping to Paola's old college and learns that one of her former best friends, Giovanna, died in a elevator fall seven years earlier, two days before that girl's intended wedding to a man, Guido, whom Paola also coveted. Guido finds out about Carloni’s suspicious inquiries and goes to Milan to warn Paola, whom he has not seen since the tragic accident. From this section, we learn that Guido and Paola are still attracted to each other after seven years and that their guilt feelings suggest that they may have had something to do with Giovanna’s death. In addition, it is clear that the vain and materialistic Paola has lost whatever passion she may have once had for her husband, Enrico. Though there is no single focalization in this phase, it is primarily concentrated on the investigator Carloni, with secondary focalizations on Paola, Guido, and Enrico. Love Affair Rekindled. The focalization now shifts to Paola and Guido, with Carloni almost disappearing into the background, and Enrico invisib le. Paola and Guido begin meeting to discuss why Carloni is making inquiries about their past, and soon Paola is calling Guido, “Darling”. The contrast between the present social strata to which the two belong is marked: Paola is wreathed in fabulous gowns and sumptuous wealth, while Guido, often shown walking on dark, rainy streets, hasn’t had a regular job since the war and is now freelancing as a car seller. In a key ten-minute scene, Paola drives into town, shakes off the pursuing Carloni, who has been tailing her, and makes her way to a tryst with Guido in a nondescript hotel room. After making love, they discuss the circumstances of Giovanna’s death seven years earlier. In that conversation they confess to themselves that they could have prevented the tragic death, but refrained from doing so, because Giovanna's fall produced a result that they both desired. Now Paola suggests that they more self-consciously and actively do away with another obstacle to their goal of being together: Enrico. But Guido angrily rejects the criminal suggestion and leaves the room. The Murder Plot. Paola and Guido make up their differences, and Paola insists to Guido that their love would not endure without material wealth. Eventually she indirectly challenges Guido’s manliness and convinces him to murder Enrico, so that they can get his money. Meanwhile Carloni and his detective agency boss, not so much interested in justice as they are in Enrico’s high fees, decide that even though Carloni hasn’t found any evidence of the Guido-Paola affair, they should fabricate one anyway in their report to Enrico. Throughout this phase, the editing pace quickens. The Second Fatal Accident. The pace quickens further. Guido prepares to shoot Enrico from the side of an embankment on the road into town, while Carloni meanwhile gives his fabricated report to Enrico. The scenes now rapidly shift between three spheres: Guido on the road at night awaiting Enrico’s car, Enrico reading the damning report about his wife and then driving into town along the road bordering the canal embankmen t, and Paola waiting anxiously at home prior to a gala party. Just prior to the intended murder event, however, Enrico’s car swerves off the road into the canal and crashes. Paola, still in her lavish party dress, rushes off to Guido, and he glumly reports that Enrico has committed suicide. In tears, Paola swears her passionate love for Guido and makes him promise to call her the next day. But Guido takes a taxi to the train station, abandoning for good Paola and the love affair. 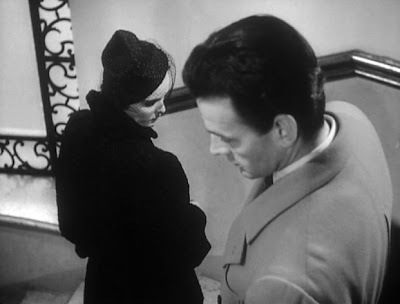 A strength of this film, underscored by Antonioni’s pensive mise-en-scène, is the visual depiction of the psychological breakdown of Paola and Guido. Another strong point is the role of Paola, herself, played by the luscious Lucia Bosé. Bosé was a former Miss Italy (1947) and apparently romantically involved with Antonioni at the time. The director’s camera certainly frames her beauty to the best possible effect. But there are some weaknesses. The role of Joy, a model who briefly flirts with Guido’s and inflames Paola’s jealousy, attracts some narrative focus midway through the film and then disappears. Carloni, the private detective, also fades away. Since the film opens with Carloni, one would expect that his role would enframe the tale and that he would appear at the close of the film. As a consequence, one is left at the end with a certain unsatisfying irresolution, a feeling that would not be uncommon in connection with Antonioni’s subsequent work. Overall, the film is worth seeing, although later Antonioni productions would definitely surpass this one. Despite the physical action of Enrico’s death, this narrative primarily concentrates on the conflicted feelings of frustration and guilt on the part of the two principal characters. In addition the film stands as a condemnation of the pervasive acquisitiveness in post-War Italian society. All the characters have overweening desires for possession. For the four principal male characters, this desire is for material wealth, irrespective of whatever human values may be violated in the pursuit of such. Enrico. His main pleasures are derived from taking over the businesses of his rivals. Carloni and his detective boss. They simply want to increase their incomes, even at the expense of truth. Valerio. A gangterish businessman who sometimes hires Guido to arrange car-purchase deals through the black market, he is more interested in making lucrative deals than satisfying his mistress, the model Joy. Guido. Even Guido is more attracted to Paola for her luxurious glamour than out of true love. For the women, the acquisitiveness is not for money, but for the men they want to possess. Joy. She wants to possess her paramour, the married Valerio, and she despises him for occasionally attending to his wife. Paola. She wants Guido, but the final result has to be on her terms, and it has to include Enrico’s fortune. Enrico’s jealousy leads him to investigate his wife, which ultimately brings Guido and Paola together and leads to her acts of infidelity. Carloni’s fabricated report in the hopes of getting more business from Enrico directly leads to Enrico’s suicide and the end of Carloni’s meal ticket. Guido’s desire for an enhanced self-image and a dream life leads him to the edge of murder and an incontrovertible lost of self respect. Paola’s acquisitiveness for Guido leads her to lose him. In the end it is Guido, on the verge of committing a murder, who finally recognizes the sordid nature of his relationship with Paola. He was legally innocent of both the death of Giovanna and the death of Enrico, but he knows that he shares some complicity in both deaths. He can no longer realize his romantic dreams if he has lost his own self-respect. He, alone, had a glimpse of the quagmire into which everyone was falling. And his decision was to take the first train out of town.